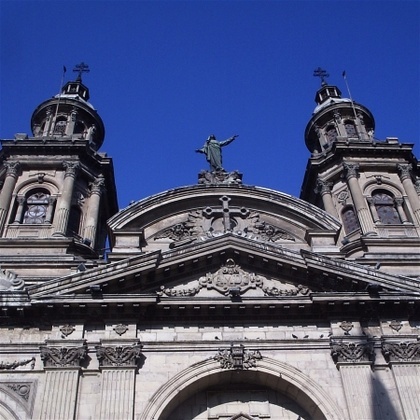 Nothing encompasses the essence of Santiago like the Plaza de Armas. In times when even locating the centre on a city map can be challenging, this square remains the unrivalled heart and soul of the capital and has more than enough to support this attribution. It’s not justkilómetro cero, the point from which all distances in the country refer to, it’s also got some of the nation’s most accomplished architecture, a free-style fusion of fountains, sculptures, palm trees and a theatrical spectacle of charlatans and bystanders that seem trapped in a warp zone of a non-stop chaos. The Plaza de Armas packs a punch of sensations, ranging from nostalgia to scandal. On the face of it, it’s old-fashioned, innocuous and almost provincial, frequented by elderly gentlemen and grannies with playful children, but it’s equally strident and outrageous, where argumentative youngsters clash with Evangelical street preachers and where passionate utopians rally to make their voice heard. Don’t expect to find here the same atmosphere twice. The one feature of this Plaza is a slight schizophrenia: while it often welcomes you to stroll around, sit back or even succumb to a siesta; at times the crowds, the heat and the deafening buzz of the environment will make you run for miles. Then again, that is in itself another quintessential trait of the centro histórico, which the Plaza de Armas conveys flawlessly. Catedral Metropolitana: built again, and again, and again and again. It’s hard to exaggerate the historical importance of the Plaza de Armas. As the midpoint of the Spanish settlement of 1541, the square was once a military training ground – hence its name – but with time it became the focus of Santiago’s social and commercial life. The city’s main supplier of food and goods, the Mercado de Abastos operated here since the 1600s until its relocation in 1817. An aqueduct used to link the square with the river supplying residents with fresh water through a fountain which was later removed and is now displayed at La Moneda. The square has endured constant changes through the centuries, but even a much controversial refurbishment of 1999 – which attempted a more piazza-esque look, at the expense of half of its former vegetation – has been unable to demote it from its status as Santiago’s primary civic centre. Since the city’s foundation, the square has been the address of some of the key buildings in the capital, including a succession of city halls, courts, old jails and of course, the Cathedral, which towers over the plaza. No less than four different churches have stood at the site of the Catedral Metropolitana, each of them devastated by a different calamity. 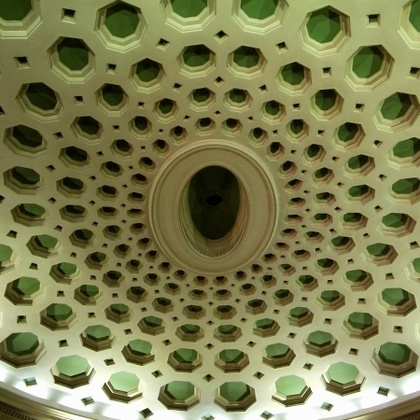 The present-day building was commissioned in 1747 and several government-sponsored architects including Toesca and Celli were involved in its design. Planning variations, however, have come thick and fast since that day, and the splendidly ornate façade by Italian architect Ignazio Cremonesi wasn’t completely finished until 1906. The size of the Cathedral cannot be fully appreciated from the front entrance, so make sure you duck around Calle Catedral to observe the building in its full monolithic dimensions. The interior of the church reveals a more understated decoration than its façade suggests. It is nonetheless a beautifully adorned church, but it falls a little short of the intimacy and emotiveness of the likes of la Merced or San Agustín. A visit to the next-door exhibition dedicated to sacred art could compliment a tour of the Cathedral, although its presence goes often undetected since it only opens to the public on Mondays. Hypnotic Art Deco at Galería Crillón, one of the area’s commercial Arcades. Facing the Plaza from the south is the cheap and cheerful Portal Fernández Concha, a kasbah of eateries and quick snack shops with few delicacies to be found, but with stacks of chatty waiters and friendly regulars. Stretching out of the Plaza de Armas in direction of the Alameda are two pedestrian walks, the Paseo Ahumada, Santiago’s unrivalled main drag and Paseo Estado, a less iconic version of the Ahumada, but almost identically busy. The Paseo Ahumada, like the Plaza de Armas, has endured controversial transformations in recent years; the fountains that used to beautify it were placed elsewhere and its original cobblestones were removed in favour of modern paving stones. But you’ll find it hard to even notice this because you’ll be struck by the sheer amount of people that parade on this street at any time of the day. Raising your head above the crowds, you’ll realise that the Paseo Ahumada has some truly beautiful architecture as well as its fair share of modern eyesores. If it all becomes a little too much for you, take cover in one of the hundreds of Galerías (arcades) that crisscross the busy streets, which create something of a parallel network of thoroughfares. You can enjoy a delightful view of some of their decadent ornamentation before resurfacing on the streets of the pulsating centro histórico.